Club Penguin Cheats by Mimo777 Club Penguin Cheats by Mimo777: Happy St. Patrick's Day PARTY! Sneak Peek! The biggest "Green" bash to hit the virtual world scene is about to go down in Tootsville! 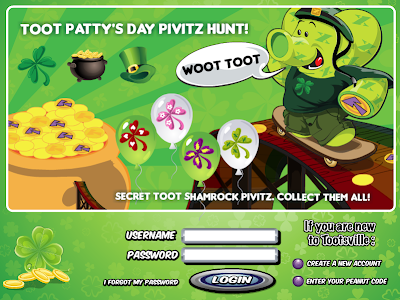 There are 7 lucky Pivitz hidden all throughout Tootsville, including 4 Secret Toot Shamrock Pivitz. Check out this pic, captured with me-ol'-spy cam, revealing where one of the Secret Pivitz is hidden. Hint: Where would you go for a spring picnic? Test your luck and don't forget your green, as Rad told me, "Those Toots wearing green, will be receiving a rare but very lucky Pivit from the Mayor." Happy Toot Patty's Day! GO FIND THE HIDDEN PIVITZ NOW! Why isn't Club Penguin having a St. Patrick's day party? Is there going to be a St. Patrick's Day party on club penguin? Will Club Penguin be having a St. Patricks Day party? Club Penguin totally FORGOT about the St. Patrick's Day party! ITS SO LAME! it's annoying that club penguin isn't having a St.Patrick's day party. The day should NOT be forgotten! It bugs me that they aren't having one. What about you guys? Cool! I think Club Penguin isn't removing "religion" based parties? Like the Christmas Party, they changed the name of it. How do you club penguin isn't the newspaper comes tonight so there is a chance and they always have the party. Er, no. Waaaaaah! I love St. Partrick's Day!! Club Penguin is not having a St. Patrick's day party? They had it for the past years. I think Club Penguin isn't having a St. Patricks party for the same reason they named the Christmas party a "Holiday Party" instead. Yeah, I noticed that too.. at least they're probably only going to give those St. Patrick's day top hats for non-members.. (which I already have.) I'm tired of hats. why isnt club penguin not have a st.patricks day party??? i can't believe cp isnt having a st patty's day party. i've been playing cp for 3 years and they ALWAYS had a party. i cant believe them!! Hey mimo! I think you and all cpg fans have noticed that I haven't been modding recently. The reason is because I have too much homework so I can't mod. I only just managed to say this! So don't be mad, I just have too much homework. P.S. I have to do homework now. I wish club penguin was having a saint patricks day party! But I think they arent coz there is too much going on like d penguin play awards and d caves reopening. im from ireland and i REALLY think they should have a saint patricks day party! I love going to see patricks day parades and it would be really fun if club penguin would have one too! I think the orange puffle is really cool! Is there any game that you can take your orange puffle to and he will play with you? So far.. they are probably not having a party because they have released a lot lately! Who knows? So far.. probably not.. but maybe! Same to you me chap! Happy Birthday me chap!! LOL!! Happy B-Day!! Very annoying! I am not really Irish, but I still think that we should celebrate this day! They might be figuring that some people don't celebrate St. Patrick's Day, but some people don't celebrate Easter, or Halloween, but CP still has parties! True! Easter is religious though, will they have an egg hunt? Sadly, no not yet! I hope CP makes one, especially a puffle who can play Cart Surfer, which is where I get my coins! That is okay! Hope you don't fail! Anyways, how could Mimo forget YOU? You are a Top Mod, and you have been modding like crazy lately! Good luck! Lol, I already had a type of exam last week. Good luck again! I agree... a parade would be cool! I think Cp sometimes to forget its audience. For example, St. Patrick's Day! There are people GLOBALLY who celebrate St. Patrick's Day naturally because of where they live! They don't have Kwanzaa parties, people globally celebrate it... They don't have Hannukkah parties, people globally celebrate it. You can't call something a holiday party if if has a Santa ride and plastic Santas all around the island. Sadly, no. There is no game you can play with your orange puffle. Yet, I hope! Maybe they will have one soon. Who knows? This is for all the people who are asking about Club Penguin's supposed St. Patricks day party. I really hope they will suprise us with something. Maybe later this week. But it looks like there wont be one on St. Patricks Day. ): Happy St. Patricks Day. Maybe we should protest? LoL Toysgoneby your funny. you can't call it a holiday party if it has a santa ride and plastic santas everywhere! I agree! Last year no water party. Whats next? No Medieval,April Fools party? No music jam? I know!! They were probably too busy with all this 'puffle rescue' stuff they forgot about it :( It's really unfair on leprechauns like me. is club penguin going to have a st.l patricks day???? ?